I’ll bet many of the amateurs have noticed that you can put up a -15 one day and crack the top 20, but if you shoot the same score during a different time of day, you might end up 30th instead. Sure, a lot of this has to do with the random talent level in that specific tournament, but the time of day plays a big role in your chances of winning back some money. Juan Schwartz helped me gather the following information so that amateurs can see, on average, what the best times of day to play are, and what scores it typically takes to finish in the money during those times. Of course, this can also help very good players reach the next level and possibly start netting profits on the game! Here’s the #1 rule — Don’t play during lunch time unless you don’t mind losing money! During lunch time or the early morning, there are only a few people playing. So, there are not enough random people playing for money to help weed out the big scores of the pros. A much better time to play is any time after 3PM Eastern, on any day. But, the BEST time to play is after 6PM on Friday. Everyone is out playing, and all the good players are getting drunk and not posting their best scores! Average 1st place score -24. Time 1: 1st -25, 5th -22, 10th -20, 20th -17. Keep in mind these are all AVERAGES. If you play the cycle (Eagle through Summit, in order) by yourself and not in a 2-player or more set, you can get stuck in a “crappy cycle” — you’re playing the same courses at the same times as 2-5 great players are. Getting stuck like this will make it a lot tougher to cash. Try playing the same course twice in a row, or mix up the order, if you find yourself “stuck” like this, and then continue. Also, these averages are based on playing the same course 10 times in a row during these times. And unless there is someone “whoring” a course (playing the same course repeatedly, or more than one person doing this if you play Eagle Crest), these averages are pretty accurate for any day. As always, Golden Tee is there for your amusement and is NOT meant to be your occupation! BUT, you can supplement your expenses on your game play by playing for prizes if you can hang with the big dogs and pick the most profitable times to cash. Heck, you may even be playing for free one day! I was curious how many of the pros, if any, play 9 holes for prizes. I had the idea since you can play in half the time, for less money, yet still win as much as you’d win on 18 holes. 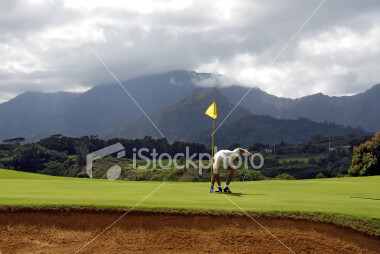 It seems to me that if you’re playing to win money, 9 holes is a much more efficient way to do so. Sure, you run the risk of a contest not finishing, but it seems like Misty Front 9, for example, always fills pretty quick. Seeing as how it only costs $4 instead of $5, AND you still win the same amount of prize money as 18 holes, AND you finish in half the time, I’d think a lot of the pros might be pursuing this option. Yeah, it’s not as fun as 18 holes since you want those complete rounds, but from a money perspective, it seems to make sense. Is the risk of a contest not filling too high, or is it just not enough fun? Well, the pros don’t like it because lots of times, it’s one wrong shot and you’re done. Over 18, you can get back a stroke or two sometimes. They also don’t really find them fun, which is understandable. The front 9 tourneys fill up, the back 9 tourneys don’t as much. Some say that 75% of the back nine tourneys don’t fill! Essentially, it’s all about volume with the 18 holers. If the big shooters played 30-40 9s a day, not many would close. I also found out that the default time for a contest to be open is 7 days. After 7 days the dollar is refunded, and the tournament closes. CONCLUSION: The pros don’t do it because of the risk of unfinished tourneys, and they have a better chance of cleaning up over 18 holes instead of 9. However, it’s not a bad option for amateurs if you only have 10-15 minutes to slip in a quick round! Unfortunately, there are some areas, even states, where players don’t have the option of playing for Golden Tee prizes! Ever since Golden Tee came out with the technology to hook up all their machines to a network, players have been able to compete in contests against people all across the country. This added a fantastic new element of competition to the game. This section outlines the different play modes and prizes in Golden Tee. Another fun new feature added to Golden Tee Live is the option to win money on a hole-in-one. Usually once per round, the game will pop up a message asking if you want to risk $0.50 to win a certain amount of money (usually between $10 and $30) if you shoot a hole-in-one. I’m not good enough to risk the $0.50, but I know many people probably bank on this opportunity! The offer isn’t just for Par 3s either…you may receive the offer on a Par 4 hole that’s reachable off the tee. So if you’re an approach shot expert in Golden Tee, you can probably sink a hole-in-one just often enough to make this opportunity profitable! You may have noticed “Give away code” under the Options menu in Golden Tee. Supposedly, a couple years back, Top Flite ran some promotions where they sent mailers to select individuals with these special give away codes. The codes would earn you special articles of clothing such as pants or hats with the Top Flite logo on them. The promotion was only short lived, though, and no codes have been given out since that time. I suspect that the option still remains in the game just in case Golden Tee wants to start up some kind of promotion again in the future. If you know someone who still has one of these codes, it’d be fun to see what kind of special clothing articles you can get, but from what I hear, it was nothing as exciting as the other items you earn simply from playing! You also have the option to play for prizes (Prize mode) by feeding the Golden Tee machine an extra dollar. Here you’ll square off against 50 people within your skill level. 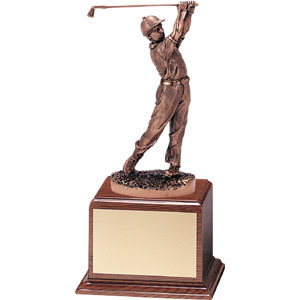 Players are separated into 3 brackets here as well – those whose best score is –11 or better, those whose best score is –1 to –10, and those who have never broken par. Prize money is credited to your account, and you can request a withdrawal at any time, if you wish (you will get mailed a check). All other players win a free “virtual ball” that’s randomly awarded from among the balls you can buy at the start of your round. Check the ‘Select Balls’ screen before you tee off to see which type of ball you won! With the normal Golden Tee Live play (or Glory mode), your stats will be tracked, and you will compete against a group of 20 people who also happen to be playing that same course at about the same time. In addition, you will be in 1 of 3 brackets, based on your best score ever on that course. New players use the easiest red tees, players who have scored –1 to –17 play the medium blue tees, and those that shot –18 or better play the hard black tees. As you move from hole to hole, you’ll see your current rank in the standings against all other current competitors on that course. When everyone in that group has finished playing, your score and final rank will be posted, so you can see how well you shot compared to everyone else who was playing that Golden Tee course at that time! 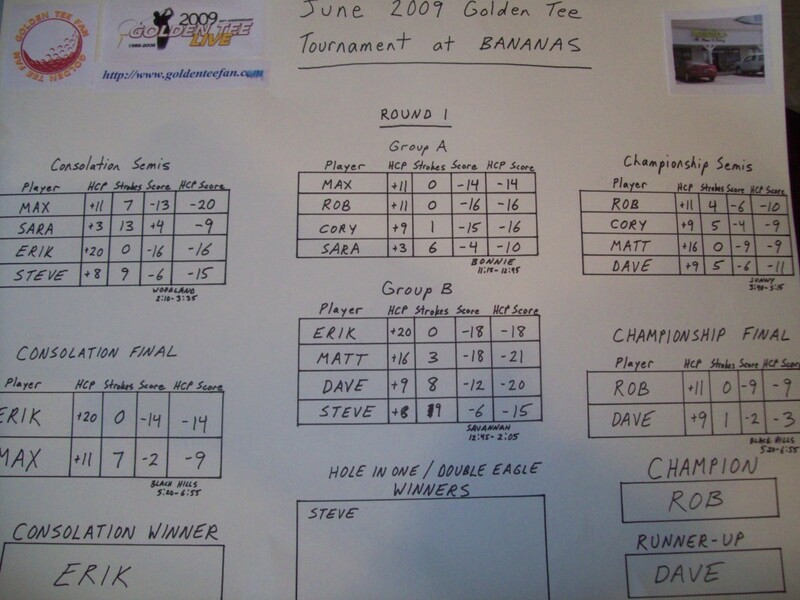 UPDATE — In Golden Tee 2009, players can choose the new option of “All Play Random Tees” in glory mode! That means you won’t be stuck on the same tee box for each round, so you can always get a challenging new look at the hole off the tee!